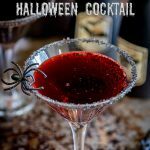 This Witches Blood Halloween Cocktail is perfect for whipping up in a big batch for a crowd. An easy to make cocktail that mixes vodka, whiskey and lemon together to create a twist on a whisky sour recipe, but with the added sweetness of cherry. Serve a pitcher of this at your Halloween party, or add it to a punch bowl with some plastic spiders floating in it for a simple creepy effect. 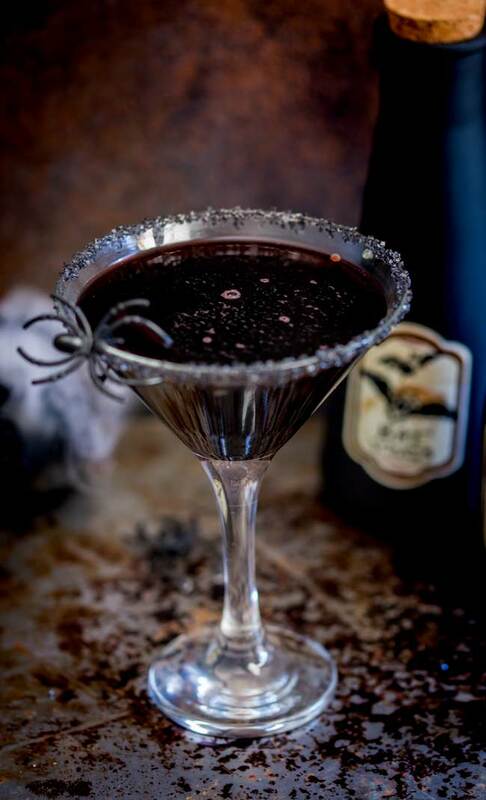 Or serve in a sugar rimmed martini glass for a dramatically spooky sip. The possibilities are frightening! Can I use black vodka in this cocktail? You sure can, in fact black vodka gives it a much spookier and dramatic feel. I tried this with black vodka and I loved the affect. You can see from the pictures below that black vodka really deepens the color, it is truely a witches blood color!!! But I wanted to ensure this was easily accessible and that everyone could easily make this so I have left the black vodka as optional, as it is still quite hard to find here. It was a bit of a boozy afternoon 😉 whilst I tested out the black vodka and took the photos….I’m surprised they are in focus – no really I did finish the photos before I drank the final batch. How do you rim the glasses? 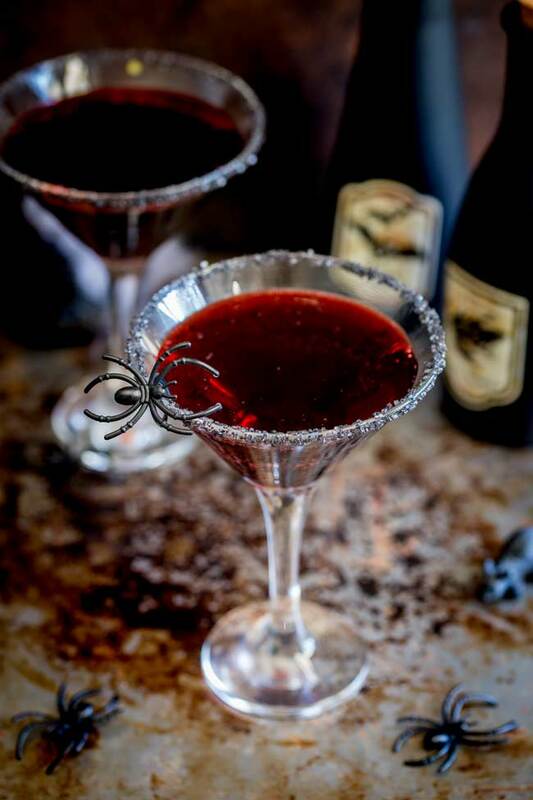 If you are serving this witches blood cocktail to a small group then you can serve it in the sugar rimmed glasses. I chose martini glasses as they always make me feel like it could be a movie. But a small tumbler or whisky glass would work too. To rim the glasses, run a cut piece of lemon around the top of the glass, then dip the wet glass into a saucer of sugar. I used black sanding sugar here, but red would be wonderful too. 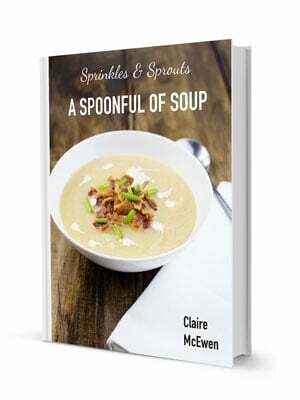 You will need a wedge of lemon and approximately 1/2 tsp of sugar for each glass. I can’t find colored sugar for my glasses! 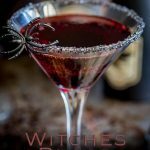 If you don’t have coloured sugar then try this trick that I used last year with my Witches Brew Halloween Cocktail. Add some food coloring, be generous you want the colour to be quite intense. Mix it with a cocktail stick. Dip the glass into the saucer. Dip the coated glass into a saucer of fine sugar. The food colouring will seep into the sugar giving it an coloured hue. 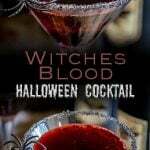 Why not pin this recipe for Witches Blood – A Halloween Cocktail. Pin it here. 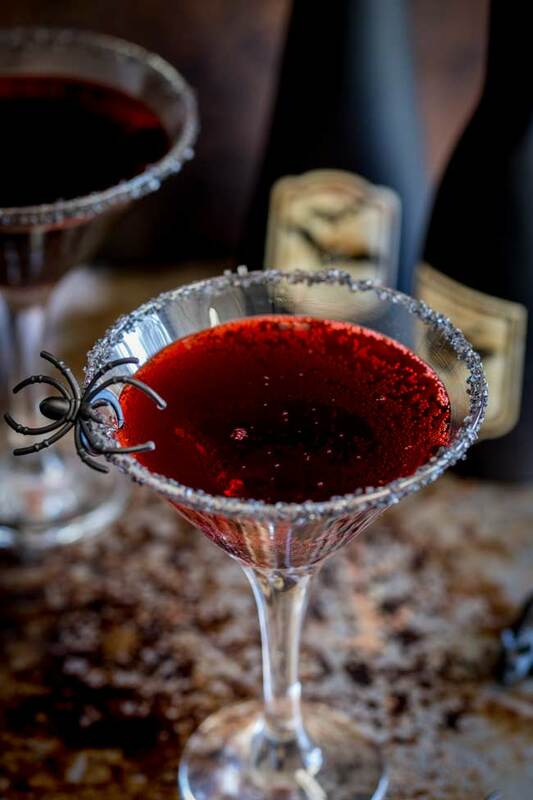 This Halloween cocktail is perfect for whipping up in a big batch for a crowd. An easy to make cocktail that mixes vodka, whiskey and lemon together to create a twist on a whisky sour recipe, but with the added sweetness of cherry. Serve a pitcher of this at your Halloween party, or add it to a punch bowl with some plastic spiders floating in it for a simple creepy effect. 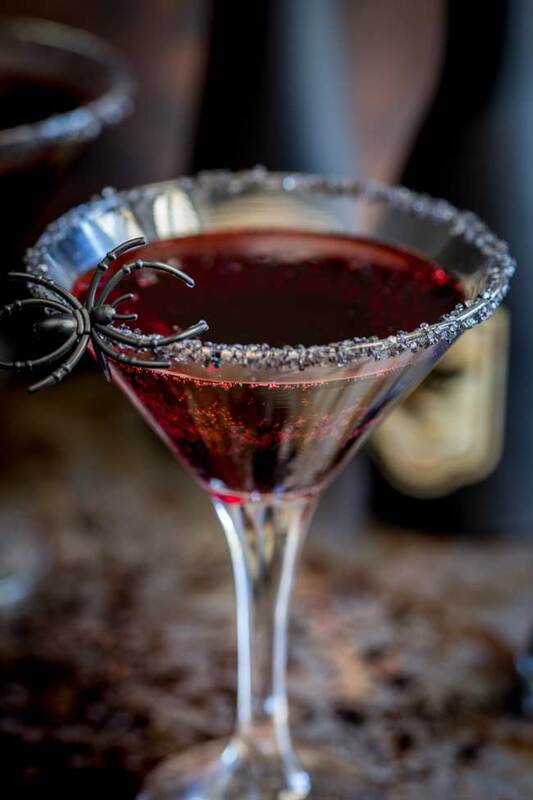 Or serve in a sugar rimmed martini glass for a dramatically spooky sip. The possibilities are frightening! Pour the cherry schnapps, vodka, whisky and lemon juice into a pitcher. Stir well with a cup of ice. Gently pour in the cherry soda and stir carefully to combine. The darker your cherry soda the darker your cocktail will be. I bought a black cherry soda for these photos. OPTIONAL STAGE: Add some food coloring, be generous you want the colour to be quite intense. 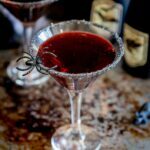 If you love food why not subscribe to my newsletter, I will drop you an email every now and then, just to say hi and send you a couple of recipes I think you might love, like this Witches Blood – A Halloween Cocktail. What whiskey would you recommend?